An MP urged Gatwick Airport to take more account of complaints about aircraft noise, at a meeting in Parliament. Nick Herbert, MP for Arundel and the South Downs met the Aviation Minister Baroness Sugg and Gatwick’s chief executive, Stewart Wingate, along with representatives of the Civil Aviation Authority, the National Air Traffic Service, and a group of MPs whose constituents are affected by noise from Gatwick air traffic. The MP raised concerns on behalf of local communities who had complained about aircraft noise. He called for ‘more engagement and serious attempts at noise mitigation’. Earlier this month community noise groups wrote to Gatwick Airport’s deputy chairman and chief executive to say that they had ‘lost confidence in the ability of the Noise Management Board, as currently constituted and led, to deliver positive and timely change in the noise environment around Gatwick’. A statement from Nick Herbert’s office said: ‘At the meeting in Parliament, MPs echoed this view, arguing that the current system of leaving Gatwick Airport to monitor noise issues was failing communities. The Minister agreed that more needed to be done to lessen the impact on local communities, and she pmmised a follow-up letter to MPs to outline the new actions being taken by the Government. “She said that community groups should engage with the Government’s policy on airspace modernisation and its new Aviation Strategy, which is currently under development. Andy Sinclair, head of Airspace Strategy and Engagement, Gatwick Airport, said “We recognise that noise from aircraft has an impact on local communities and we will continue to do everything we can and listen to feedback to help improve the lives of people affected by noise. “The CAA recently confirmed that Gatwick’s noise footprint has shrunk largely thanks to an Noise Management Board initiative to modify the A320 family of aircraft so they make less noise. Another NMB initiative also recently changed where some aircraft start their final approach to the runway, which reduced the previous concentration of noise and dispersed them in a more fair and equitable way. 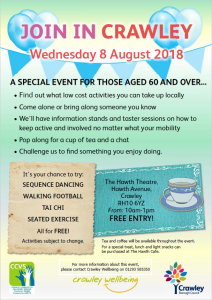 I would like to invite you to ‘Join in Crawley’ on Wednesday 8th August, 10am – 1pm at The Hawth Theatre. 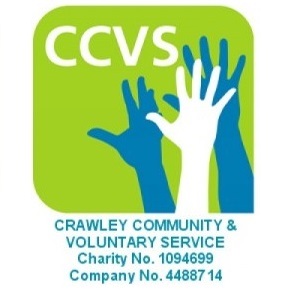 There will be information stalls and taster sessions such as Tai Chi, Seated Exercise and Walking Football to name a few. So pop along and join us for a cup of tea and a chat and challenge us to find something you enjoy doing! 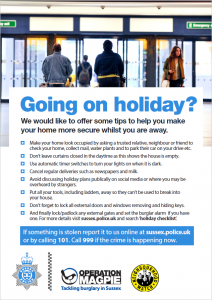 We would like to offer some tips to help you make your home more secure and to reduce this risk whilst you are away. Make your home look occupied by asking a trusted relative, neighbour or friend to check your home, collect mail, water plants and to park their car on your drive etc. Consider using the Royal Mail’s “Keep Safe” service – They will keep your mail for up to two months while you’re away. Don’t leave curtains closed in the daytime as this shows the house is empty. Use automatic timer switches to turn your lights on when it is dark. Cancel regular deliveries such as newspapers and milk. Avoid discussing holiday plans publically on social media or where you may be overheard by strangers. Cut your lawn before you go. Consider leaving important documents and valuable items with other family members, a bank or in a safe. Consider leaving valuable items kept in your shed in the house. Put all your tools, including ladders, away so they can’t be used to break into your house. Don’t forget to lock all external doors and windows removing and hiding keys. If something is stolen report it to us online at sussex.police.uk or by calling 101. Call 999 if the crime is happening now.